Join the discussion on our forums! Come discuss Evolving Spores over in our dedicated Evolving Spores discussion topic. This card was so underrated... in the right deck its preeetty good. I think this card could be decent. While a couple choices are bad cough +1/+1, there are plenty of strong effects too. Getting +3/+0 is makes this card into a 4 mana bloodlust that is permanent. Poisonous is also a rather strong effect as it let's you trade your smaller minions into larger taunts. This brings me to the biggest issue with this card in my opinion. Currently, no deck in standard can use this card. Token Druid has been dead since Karazahn. However, with more anti-aggro cards being printed and some better buff/board fill cards for druid, this card might help Token Druid come back into the meta. However, the deck I think this will work the best in is Egg Druid in wild. Giving all of your 0/2 eggs a permanent bloodlust or taunt or poisonous to work with another one of your buffs, the eggs become a lot scarier and can force people to trade into them, letting you have their deathrattles go off. This may not work out, Egg druid also fell out of wild meta a bit ago. Hopefully though this card will work out and bring back both of those archetypes. 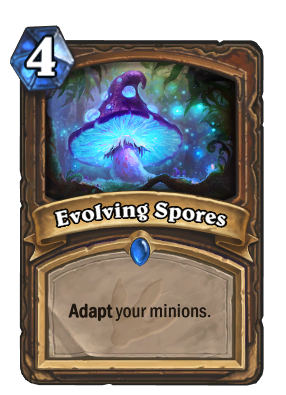 The only adaptations that are strong in egg druid are Flaming Claws, Rocky Carapace, and Living Spores. To be fair, you still have a 70.83% chance of finding at least one of those in your three options. Maybe you can throw in Poison Spit on situational board states, upping the odds to 83.33%. In my opinion, this has more potential on a medium-sized board threats like Druid of the Claw than on a full board of random garbage tokens like Patches the Pirate. On a board of a few meaty minions, Flaming Claws, Rocky Carapace, and Living Spores are still strong to find, but Lightning Speed becomes game-breaking, and Crackling Shield and sometimes even Massive become options. Seems like it will either fit into aggressive token decks where, depending on the adapt, it could be pretty useless or as a 1 of in jade decks where it kinda seems like a win more card. Overall seems a bit too expensive in combination with the fact you need a board. Could have some cool synergy with Living Mana , Innervate , play this card turn 10. Put on Sleep's Holy Mountain and just stared at the card art for like 2 hours. Poisonous might be pretty good, or divine shields, but 1/1 is garbage. I can totally see it being played! Deathrattle summon 2 plants would be really good. Gain +3 Attack could be considered as a 4 mana bloodlust. i am just gonna say that this card is very bad. adapting is worth about 0.5 mana so you have to adaot 8 moinions (impossible) to just get your mana's worth. and even then you can just either play mark of lotus or soul of the forrest or savage roar. so far the druid players have gotten nothing but the shaft. adpting is worth 1 mana brah, with the exception of taunt (0.75 mana), divine shield (1,5 mana), +3 atack or +3hp (1,5 mana), liquid membrane (which can cost zero up to 3-4 mana depending on the minion, but i think it's worth 1,5), stealth (0,75 to 1 mana). I'd also like to know where you took your numbers from. Not trolling, mind, just genuinely curious. I will just write it here, just because this leak (I'm talking about Evolving Spores) is relatively new, in hopes of being seen. Some kind of a Russian 'web gazette' known as Lenta.Ru talked to Matt Place and Mike Donais (the article was about how some Russians have become HS champions, here it is: https://lenta.ru/articles/2017/03/29/hs/) and they 'accidentally' revealed a new minion. It is a 3/3 giving a weapon upon its death. This weapon gives armor each time a player attacks with it. The devs also stated that they want to support control decks and ruin the aggro. P.S. Don't mind my terrible English. If you ever pick the +1/+1 adapt, you literally just spent 4x the mana cost on Mark of the Lotus. Very lackluster card for the cost. Yes you can get some good stuff and it's versatile, but it's RNG-based. When desperately needing taunt or more minion health to stabilize, you might get all offensive adapts. When needing lethal, you might pull all useless defensive adapts. Might be okay in arena; I doubt anyone will bother in constructed. Like zoinks, Scoob, I think we're made out of water now. according to a Twitter post from the devs, Wild Pyromancers effect can destroy all minions if you adapt poison on it. so if you adapt poison on pyromancer with this card, that is a 6 mana twisting nether for druid. also something interesting is that damage done from a deathrattle that is on a minion that was adapted with poison will not destroy a minion. like firey bat for example.